Jennifer Akkermans is a Canadian artist, whose work examines the discomfort and anxieties of not feeling at home. In 2014, she moved from Calgary, Alberta, to Waterloo, Ontario, pursue her MFA at the University of Waterloo. Since then, she has used herself as a case study to examine how one might build a home for oneself somewhere new. Likening her own journey to the immigration of her grandparents from Holland in the 1950's, Jennifer realizes that, although the details are specific to her, her journey is not unique. She hopes that by being honest, and sharing this work, she might find others who long to feel at home as well. 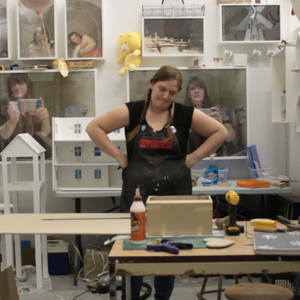 Jennifer has recently completed her MFA at the University of Waterloo, where she presented her thesis exhibition, You Can Never Go Home, in the University of Waterloo Art Gallery. She holds a BFA (with distinction) in Fibre from the Alberta College of Art + Design in Calgary, Alberta. Jennifer is a Resident Artist at the Living Arts Centre in Mississauga, Ontario. Currently, she has artwork in an exhibition at Pier 21 in Halifax, called Canada: Day One. She is also working on a project supported by a grant from the Region of Waterloo. She currently lives and works in Waterloo, Ontario. Jennifer has had solo exhibitions at the Art Gallery of Calgary, Visual Arts Alberta, and Stride Gallery. She exhibited in Caterina Pizanias' New Alberta Contemporaries, the inaugural exhibition at the Esker Foundation. She has done multiple performances and has produced a documentary through Emmedia's Production Access program. Jennifer has participated in residencies at the Banff Centre, the Gushul studio, and the Fluid Festival. In 2015, as a recipient of the Shantz Internship, she spent two months in Cologne, Germany, as a studio assistant to Alexandra Bircken.